This week we’re going to be digging into a different strategy for this series: Lands. With the release of Commander 2018, I’m sure everyone has become a bit more familiar with the damage a land-focused deck can do thanks to Lord Windgrace. Personally, Lands is one of my favorite strategies in Commander. As a primarily green player, playing multiple lands per turn gets my blood pumping like few other things, and I truly believe there are few pleasures in Magic that can compare with having all the lands in your deck on the battlefield. Despite what your first impressions may have you believe, there are several flavors to a land-focused strategy in Commander, and for this reason I’m devoting a two-part series to two vastly different approaches to the Lands theme. Of course, there are some through lines among these strategies, particularly from a philosophical point of view. Ultimately, a land deck will want to squeeze advantages out of each land played beyond the promise of additional mana in the future. This means that our deck’s likely going to include many cards with the ability Landfall, or else other cards that reward us whenever we play a land. Thanks to Magic’s two excursions to the plane of Zendikar, a variety of these effects exist with degrees of potency, and at their best, these effects will allow us to amass card advantage and hoards of creatures. 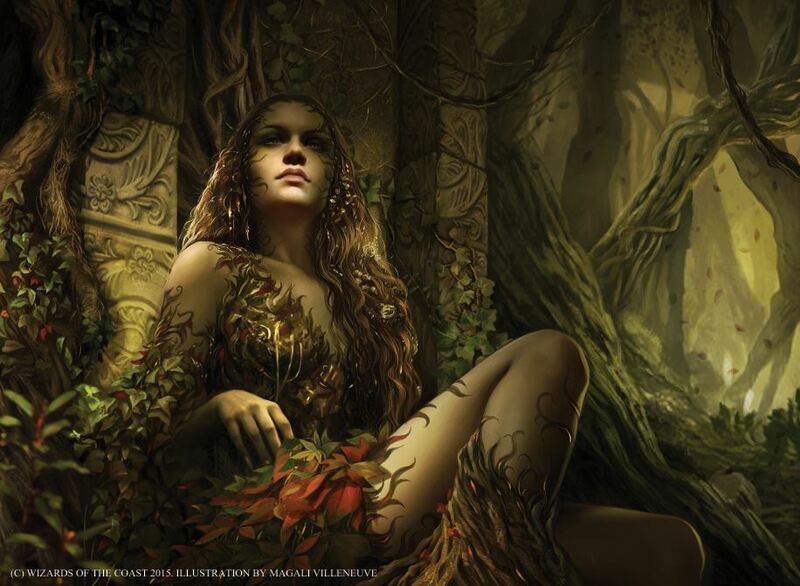 Beyond Landfall, Magic has found numerous creative ways to interact with lands, from suites of cards aimed at recurring them to cards intending to animate them, and of course, cards that allow us to cheat extra lands into play. The commanders we’re going to address are Tatyova, Benthic Druid and Omnath, Locus of Rage. On their surface, these commanders would appear to demand decks built similarly. However, the advantages they provide require specific deckbuilding considerations. Let’s start at the most rudimentary level: RG vs UG. The key difference here is Simic’s access to card draw, enabling spells that allow us to play multiple lands per turn like Burgeoning or Exploration. If we’re drawing lots of cards, we will almost always be able to make the most of these kinds of spells, and Tatyova makes this process even simpler allowing us to replace the land we play with gas from the top of our deck. In contrast, a Gruul deck won’t be able to make the same use of these spells. While green alone doesn’t have too much trouble drawing cards in commander, it isn’t nearly as consistent as blue, meaning that the same Burgeoning or Exploration will fade in usefulness after the first couple land drops. However, what Gruul does offer us is a consistent win condition in Omnath, who will make us an army of giant dudes, and threatens to turn each into a Lightning Bolt at a moment’s notice. This means that our Omnath deck is more interested in spells that put lots of lands into play at the same time, on demand. This isn’t to say that there isn’t some overlap in these lists, just that they both have divergent means of achieving a similar end. In their respective decks, Tatyova is an enabler, while Omnath is a win condition. Were it up to me, I would be able to partner these two commanders, and I’m doubtless the resulting deck would be my favorite of all time. But since we’re forced into playing these commanders separately, and there isn’t a synergistic Temur alternative, we’ll instead lean into the differences imposed by their respective colors. This week we’ll focus entirely on Tatyova, and in the next article we’ll dive into Omnath. Now that we’ve established that Tatyova is advantaged by spells that allow multiple land drops per turn, we also begin to see a few of the intricacies that make blue an appealing partner for a land deck. In particular, Blue offers a handful of abilities that bounce our lands back to hand to be played all over again. With Tatyova on board, suddenly a card like Summer Bloom represents the ability to draw three cards, and even if we’re out of lands in hand, we can always bounce some of our lands to net mana and cards. I made a point previously that Omnath prefers bursts of lands, but this isn’t to suggest that Tatyova is unhappy to see a Skyshroud Claim. In fact, casting a card like Scapeshift with Tatyova on board threatens to draw us more cards than we know what to do with, and even if Tatyova is removed before the resolution of Scapeshift, we have a number of land recursion spells that will allow us to reap the benefits of lands in our graveyard deep into the game. This is what makes Tatyova such an effective commander; she lets us to churn through our deck by playing the cards that will enable us to cast the cards we draw. Deck Goals: Play as many lands as possible so that Tatyova can dig us into a win condition. Once we have our top end spells, play them with counterspell backup, and play out enough threats to overwhelm the board. At first glance, we’ll notice that this is a deck with a relatively lean curve, with an average CMC of 3.39. While this may seem like a rather standard curve for most Commander decks, in a deck attempting to play as many lands as possible, we could conceivably be playing a heavier top end. Instead, I’ve opted to go heavy on value creatures and spells, with a selection of top end creatures intended to close out the game. Admittedly, there is one aspect of this deck that I see as an obvious flaw: a lack of a secondary win condition. In most of the decks I demo, there is usually an extra combo, or sequence of spells that serves as an “I win” button if the game is dragged out too long. Typically I try to keep these sorts of combos on theme, so as not to detract from the primary game plan. For this particular deck, I ran into an issue. We’re working towards creating a value engine, and our commander is intended to be the centerpiece. Like most decks built around engines in Commander, if we stray too far from the components that make the engine run, we’re likely to stall out. Here, we want to be playing Tatyova, and once we play her, we need to have a lot of options to play extra lands for generating value. This means we need a relatively high land count (39 lands), and we need most of our spells devoted to putting them into play. 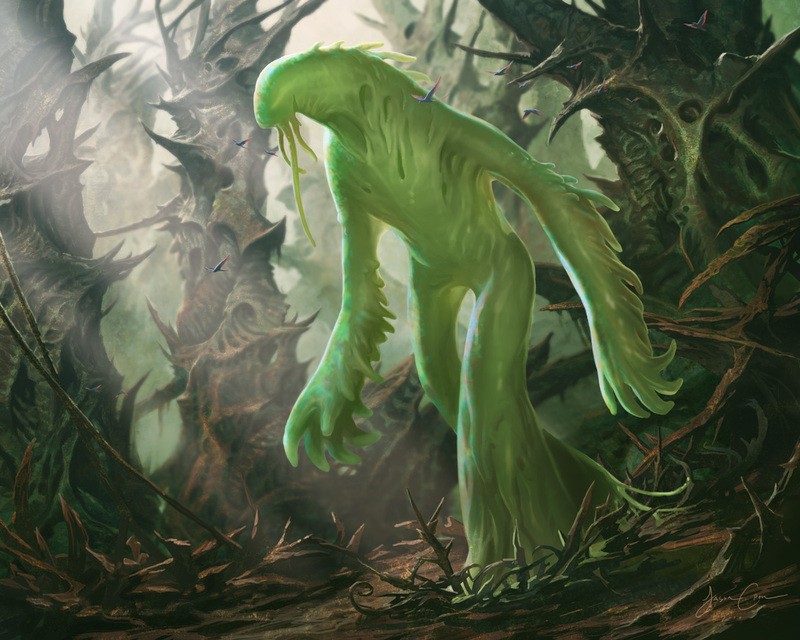 For this reason, we have precious few spots left for win conditions, and I’ve opted for a focus on big creatures that synergize with our lands theme. The idea is to ensure that all of our pieces are complementary such that we can consistently succeed with our game plan. Normally, I present these articles with a top-down approach. We start with the win conditions, and once we understand the way we intend to win, we fill in the supporting pieces. With this deck, we’re going to look at our engine, and then see how our win condition fits in to take advantage of it. The most critical elements for the success of this deck will involve our ability to hit additional land drops, while digging deeper into our deck. This will ensure that we’re able to play Tatyova early, and that we’re able to begin taking advantage of her ability immediately. As we can see, these two sections make up the biggest chunks of cards in the deck. My goal when building this deck was to ensure that our opening hand always had two or three ways for us to begin building our manabase, or else digging into more lands to hit our land drops. I also tried to keep our curve low for most of these cards, so that we can begin accelerating almost immediately. One element that’s missing from our “digging” section is large draw spells. It makes sense that a deck like this might want a card like Stroke of Genius to pump all of our mana into and achieve a massive windfall. However, I opted for cards like Courser of Kruphix and Dryad Greenseeker instead. Ultimately, we want to have Tatyova on board, and we want to be using her ability to draw us all the cards we need. Cards like Greenseeker and Courser, while limited, should provide us a consistent flow of lands for us to make the most of Tatyova and the cards in our “Landfall” category. It’s also worth noting that of these sorts of effects, a few of them are particularly potent in their ability to “draw” us cards. Oracle of Mul Daya will dig us deeper into our deck, while also granting us additional land drops. Future Sight functions similarly to Oracle, and in combination with Azusa, Lost but Seeking, we have the potential to net three or four additional cards per turn with Future Sight. 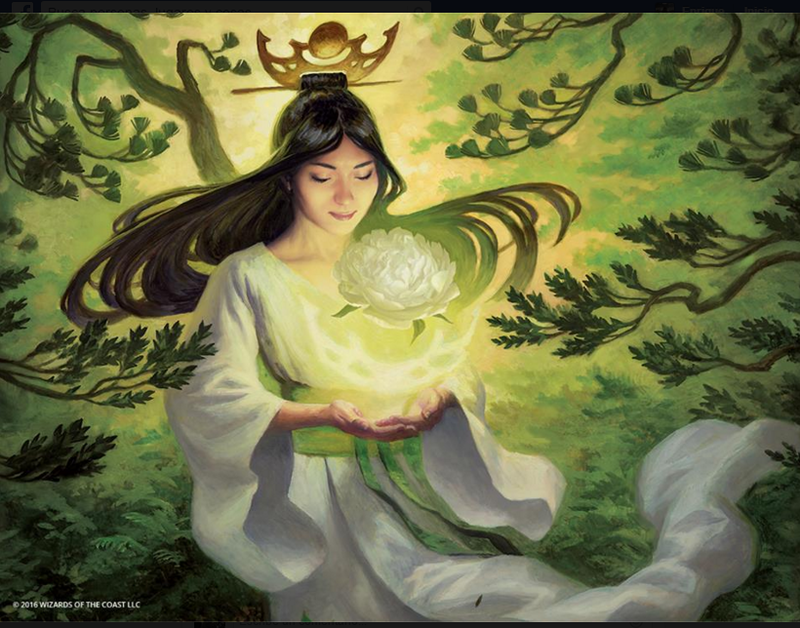 In fact, all of these abilities that let us play lands from the top of our deck become particularly good with our spells that let us play additional lands each turn: Burgeoning, Exploration, Summer Bloom, Azusa, Lost but Seeking, and Wayward Swordtooth. We will be able to enable game states where we’re using these effects to play extra lands off the top of our library, which in turn triggers Tatyova drawing us more cards, and we can then play any lands we draw with Tatyova drawing us even more cards. Generating loops of value like this will very quickly put us far ahead of our opponents, and should give us the fuel to start pressuring them early. 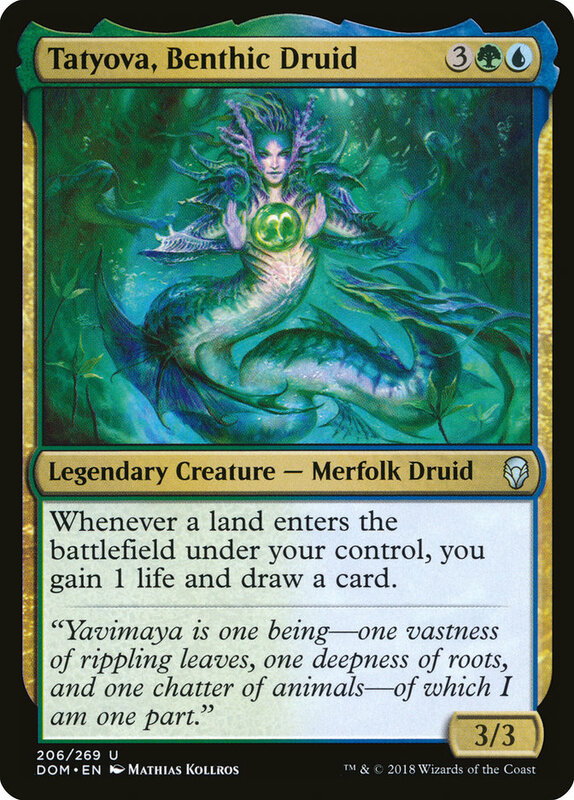 Even without Tatyova on board, we still have a handful of effects to benefit from each of our lands when they’re played. 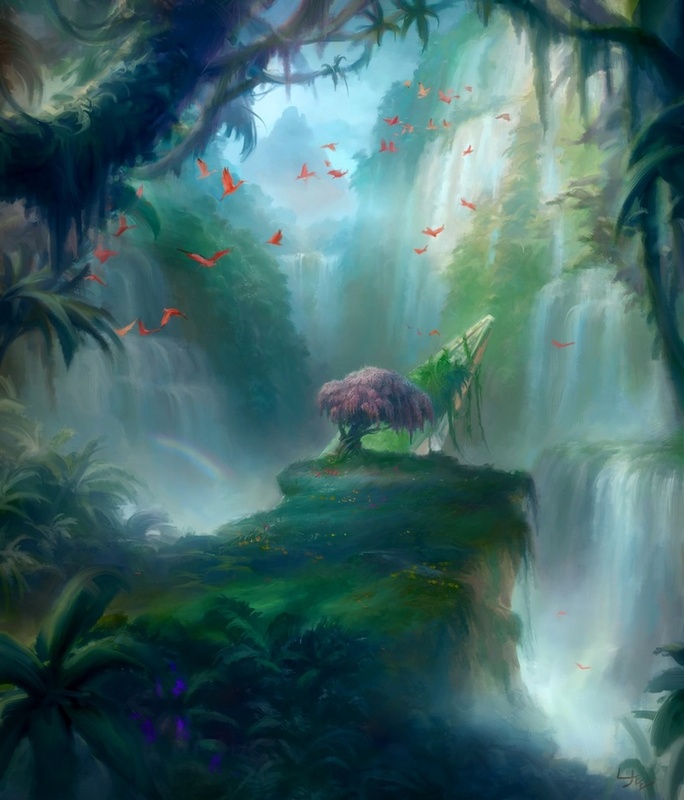 Cards like Lotus Cobra and Khalni Heart Expedition can offer us the extra mana we need to get maximum value from our spells each turn, and will help ensure that even a few seemingly innocuous land drops are actually pushing us towards our long term goal. Tireless Tracker also serves as a replacement effect for Tatyova, and should she survive, we’ll end up with a handful of clues for us to pump our extra mana into. Speaking of mana sinks, for a deck aiming to play so many lands, we’ll want to have a handful of effects to spend our mana on. Budoka Gardener will flip very quickly in this deck, and threaten to make giant Elementals each turn. Kefnet the Mindful will let us draw cards with our extra mana, and even has the added bonus bouncing our lands, should we still have extra land drops to make. For this deck we should always have a surplus of cards in hand, so Kefnet doubles as a durable beater and blocker in a pinch. Meloku the Clouded Mirror offers a similar utility to Kefnet, letting us bounce our lands to ensure we max out our land drops. Meloku also offers us a form of reverse landfall, granting us tokens for each land bounced. With Azusa on board, we could very realistically put together a rather large army in a hurry thanks to Meloku. 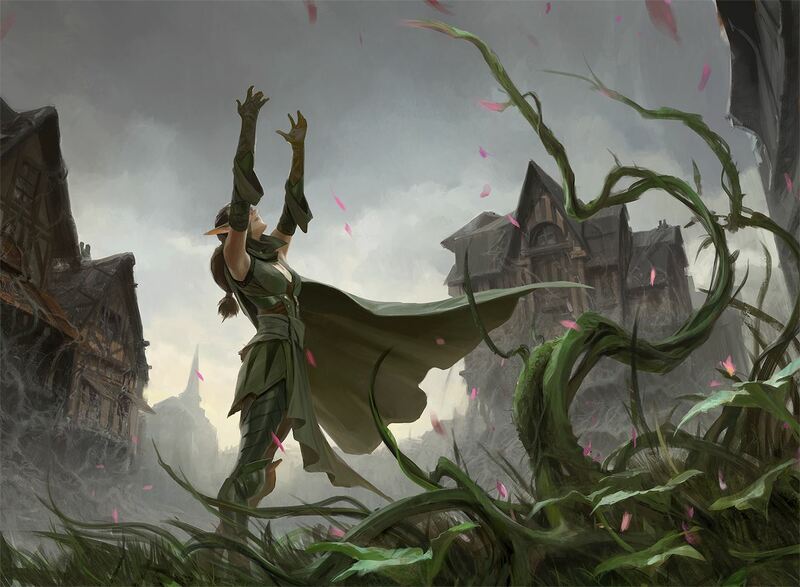 We don’t typically think of Planeswalkers as being manasinks, but Nissa, Steward of Elements breaks this mold. I really like Nissa for this deck because she plays so nicely with our top deck abilities. With a Future Sight on board, Nissa can scry us away from dead cards. Otherwise, if we know a land is on top of the deck, we can use her 0 ability to put it into play. If we’ve pumped a lot of mana into Nissa, she suddenly threatens to put our big creatures into play for free, or else she can animate our lands and start beating down our opponents with 5/5 flying Elementals. Our other planeswalkers are here for value. 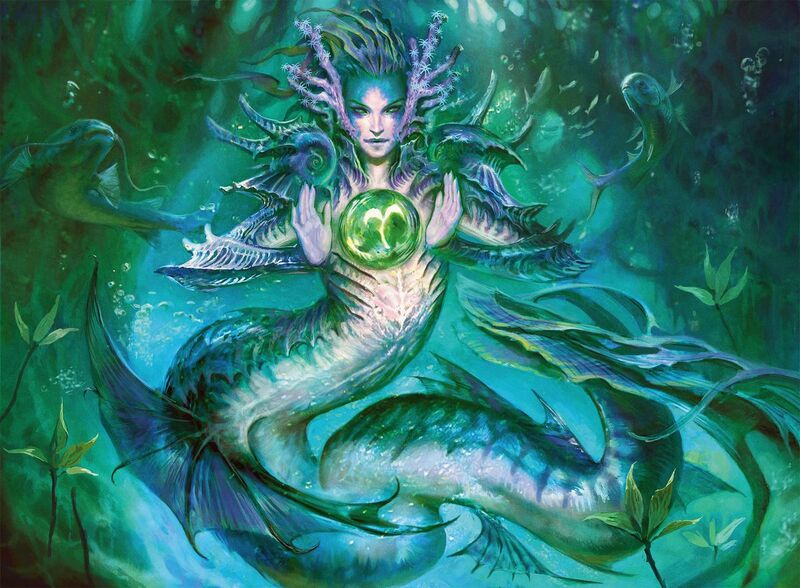 Kiora, the Crashing Wave and Kiora, Master of the Depths are here primarily for the minus abilities, both of which dig us into more cards and help enable our land strategy. Unfortunately, the plus abilities on the Kioras are somewhat lackluster, although I can imagine situations where they might be useful. These are likely easy cuts if you have other cards you want to try, but this is the most natural home I have for these two, and I didn’t want to waste the opportunity. Nissa, Vital Force, on the other hand, is a slam dunk for this deck. Her plus ability animates a land to pressure our opponents, while her minus brings back any permanents we may have lost. But really, we’re most interested in Nissa’s ultimate. Unlike most planeswalkers, we can realistically imagine using Nissa’s ultimate, given that we can activate it the second turn she’s in play. The potential to have an emblem that lets us draw off of every land played essentially offers us a bulletproof copy of Tatyova, and with Tatyova herself in play, it puts us in position to double our payout for each land we play. Another element of our engine that we’ve not yet addressed is the ease with which we can recur lands from the graveyard. With cards like Crucible of Worlds and Ramunap Excavator, our graveyard represents an additional source of land drops, and having these options opens up a slew of additional spells we can benefit from. In particular, knowing that we can get our lands back from the graveyard means we don’t have to be afraid of sacrificing our lands. Sylvan Safekeeper is a cheap and efficient way for us to protect our most important creatures, while Dreamscape Artist lets us hit two land drops for Tatyova. Crop Rotation is an incredibly powerful card, and it’s slowly getting the recognition it deserves. Being able to tutor any of our lands at instant speed for a single G is incredibly powerful, and gives us the potential to surprise an opponent with a Maze of Ith or Wasteland when they thought they were safe. Another potent spell that takes advantage of our land recursion is Constant Mists. With such a cheap Buyback ability, and with our potential to play so many lands, we can likely keep the board under perpetual fog. More than likely, however, most opponents will just start ignoring us once they know we have Constant Mists, and begin killing each other. For future reference, if you know your opponent is playing a land strategy and has a Constant Mists in hand, you should work with your opponents to kill that person as quickly as possible. Any deck trying to point the heat in another direction is up to no good, and our Tatyova deck is no exception. The big daddy of land sacrificing abilities is Scapeshift, and in this deck Scapeshift represents the ability to draw an obscene number of cards with Tatyova. What’s even better is drawing into Splendid Reclamation with our Scapeshift, and essentially doubling our land count and card draw that same turn. Reclamation is one of this deck’s big payoff spells, and will reward us for all the lands in our graveyard. Now that we’ve covered the bulk of our engine, it’s time to take a closer look at our late game spells. We’ve already talked about a few potential beaters, and there are games where a card like Meloku the Clouded Mirror could take over, but the following are the cards we’ll be aiming for to ensure a clean kill. The majority of our biggest threats sport the Landfall ability. 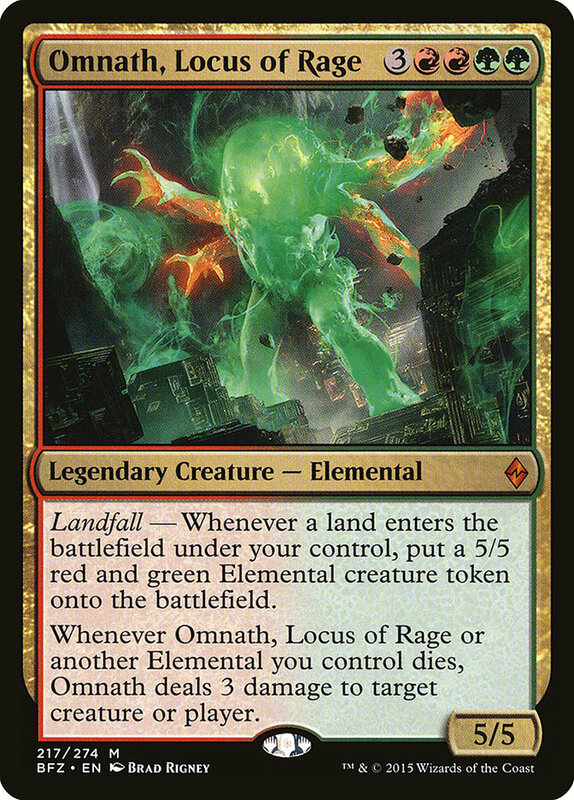 Rampaging Baloths, Roil Elemental, Avenger of Zendikar, and Zendikar’s Roil are all classic Landfall spells. By the time we’re playing any of these, we should have our engine going, and should have multiple ways to put extra lands into play. 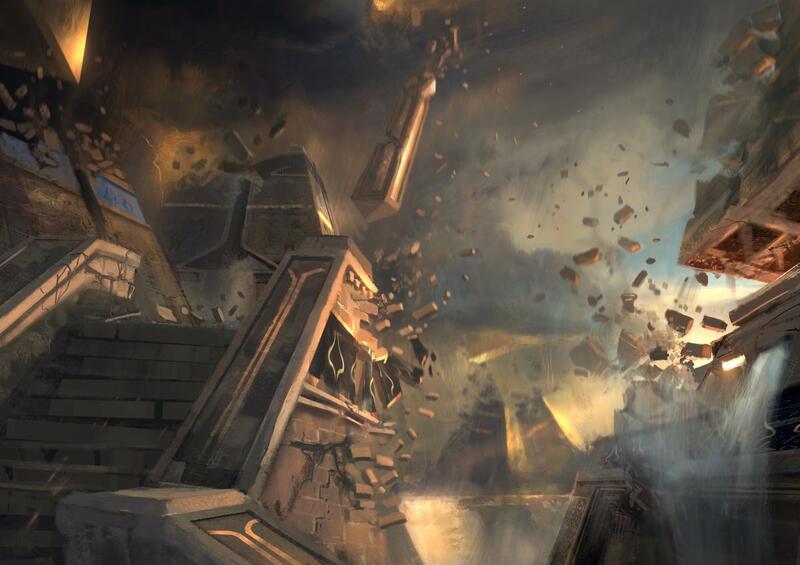 Once our opponents are worn down, Avenger can come down and end a game on its own, especially after a few land drops. Roil Elemental will threaten to steal the best creatures our opponents control, and Rampaging Baloths and Zendikar’s Roil will make a lot of bodies. Outside of our Landfall threats, Titania, Protector of Argoth is our payoff for all of the land sacrificing we’ve included. Even the combination of a Crucible of Worlds, Evolving Wilds, and Titania is solid value, and will net a bunch of 5/3 bodies to harass our opponents. Multani, Yavimaya’s Avatar will reward us for our heavy land focus, counting those on the battlefield and those in our graveyard. What’s better is that Multani can recur himself by simply bouncing two lands back to hand, which simultaneously fuels future land drops! I feel like I write about Nezahal, Primal Tide in every other article. Every time I write, I proclaim my love for this briny sea beast, and this week I will once more. Nezahal does every thing we want. He protects himself, he can’t be countered, and he draws lots of cards. In this deck, discarding three cards should be easy, especially given that Nezahal gives us an infinite hand size, and if we’re discarding lands we won’t have much trouble getting them back. The last card I want to highlight is Liege of the Tangle. I’ve never seen this card played, and the reason why is rather obvious. Upon connecting with an opponent, Liege will animate any number of our lands, generating a huge army of 8/8s that will likely end the game on the following turn. The problem? Now our opponents have a full turn cycle to Wrath us, and simultaneously destroy our creatures and lands in the process. However, I think there are a few constructive solutions here. We’re in blue, so we have a few counterspells to protect our army from potential demise. But I think the more effective option is to simply be conservative with the ability. We should have more lands than we know what to do with, and if we can even animate four or five of them, we should be in a good position to take down our opponents. Otherwise, if we can even make sure to protect four of our lands, we’ll have the ability to Splendid Reclamation if our plans fall through. I mentioned that one of my biggest reservations with this list is the lack of an alternate win condition, and I also mentioned that I’ve elected not to include cards like Stroke of Genius or Blue Sun’s Zenith. However, if you find yourself having difficulty winning, I think we could easily include one of these large draw spells as well as Laboratory Maniac as an alternate kill condition. It could also be worth including a card like Craterhoof Behemoth to help push our army of dudes through. There are a few spells like Rude Awakening and Sylvan Awakening that also animate our lands for an alpha strike. I stuck with only Liege of the Tangle for this effect since it gives us more control on how many lands are animated, to reduce the potential of being blown out. Genesis Wave could be a good mana sink in a deck like this, although with roughly 20 instants and sorceries, I decided not to include it. This deck could play spells like Storm Cauldron with the expectation of being able to replay our spells faster than our opponents. While this is certainly an option, I feel like we would draw a lot of heat, and make us a primary target. If you do go this route, Mana Breach, Sunder, and Overburden would be more good options. One deficient area of this deck is removal. We’re not packing a lot of removal in favor of spells that benefit our engine. But if there are too many creatures pestering you, Evacuation, Curse of the Swine, and Ezuri’s Predation would be solid choices. Thank you for taking the time to check out my article! Next week I’ll be bringing you the second half of our lands series with an Omnath, Locus of Rage deck! Omnath is one of my favorite commander decks, and it started as a budget build that I’ve built up over time. I’m excited to finally have the chance to share my list with you all. Until then, I wish you all the best and happy brewing!